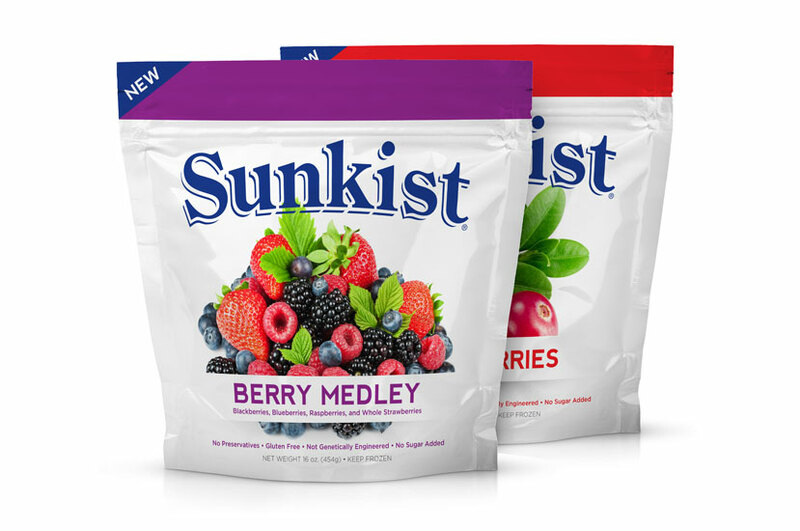 Sunkist Packaging for their new frozen fruit product line has hit the shelves and melds the classic Sunkist® brand with the trend in frozen smoothie blends. This product has received an immediate sale success as consumers feel secure about the brand and are seeking easier ways to make smoothies for clean eating. This project utilizes color coding, clear labeling and professional food photography to communicate with consumers the contents of each frozen fruit package. With a wide range of frozen fruits to choose from, this design helps consumers identify what fruit they are selecting from shelves based on the display. This brand prides itself on producing the highest quality of products, which is matched in the highest quality of packaging design in order to meet the consumer’s expectations of the brand.